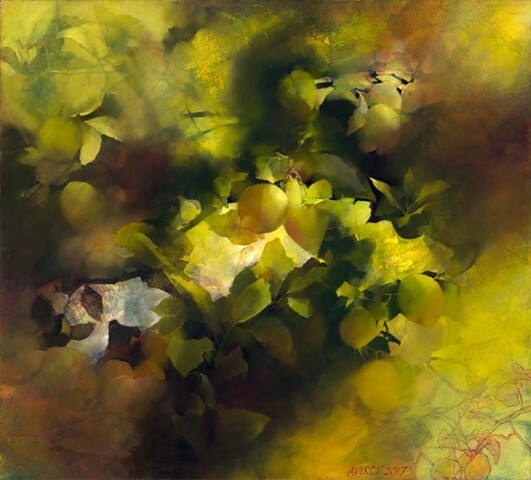 I first went to the lemon tree because of the way the fruit glowed in the morning sun. I stayed for the twist in the leaves, tough and waxy, the entangled ingrowth and return. This was something of my own complication, of my twist away from pain and the movement of returning to what insists on being seen. I drew for a month, then did a series of watercolor studies. I struggled against a seemingly invisible resistance. When there is conflict in nature, nature forms a spiral. On canvas I began with that spiral. During the next year I tried to turn a heap of signs into a presence: no contour, no cavity, could betray a moment’s flickering of the intensity of depiction. But I kept losing the larger movement. It surfaced only to sink back. It was no longer enough to paint form. I had to scrape down and uncover a ground empty of form, work light into it until it no longer disintegrated into colored paint. The substance of the visible world had grown thin, revealing the glow that lay behind. The glow erupting into leaves, fruit, branch, sky, and then dying back. And we are alive in it. My essay on painting and memory, “Immaterial Witness: An artist excavates the ground of memory and imagination,” appeared in the Summer/Autumn 2010 issue of the Harvard Divinity Bulletin. “A Primitive Mind,” my essay about the making of A Mind of Winter, appeared in the January 2011 issue of Poetry.